WBO world minimumweight champion Vic Saludar (18-3, 10KO’s) is training hard for his first title defense on February 26 against Japanese challenger Masataka Taniguchi (11-2,7KO’s). The fight will be held at the Korakuen Hall in Tokyo. Saludar took the title in Kobe, Japan last July 13, 2018 against another Japanese, Ryuya Yamanaka by unanimous decision. Saludar decked Yamanaka in round seven with a hard right hand that turned the tide of what started as a close fight. A little more than a month after that fight, Yamanaka retired due to medical reasons after he was diagnosed to have suffered a subdural hematoma; when blood collects between the thin layers covering the brain due to head trauma. Apolinario is an unbeaten prospect with a 9-0,6KO’s record while Abcede (18-8,12KO’s) won the WBA Asia flyweight title last year by knocking out in two rounds Thai Yutthana Kaensa in Bangkok. 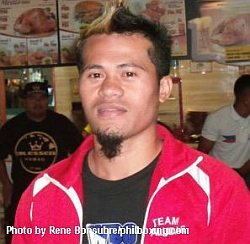 Canoy (14-3-1,7KO’s) had to settle for a no contest in an IBO world title fight in South Africa last December when defending champion Simpiwe Konkco suffered a cut due to a clash of heads and the fight was stopped in round four. The 28 year old Saludar was born in Polomolok, South Cotabato. In his first attempt to win a world title he was stopped by then WBO champ Kosei Tanaka in six rounds in Aichi, Japan on New Year’s Eve 2015. The 25 year old Taniguchi has seen action twice in the Philippines. In 2016, he knocked out Joey Bactul in two rounds in a fight held in Maasim, Sarangani. Then a year later, he stopped Benjie Bartolome in one round in Makati City. Other Filipino victims on his resume are Dexter Alimento, Vincent Bautista, Reymark Taday and Joel Lino. Taniguchi won the vacant WBO Asia Pacific minimumweight title by unanimous decision against Lino last November in Bangkok. Taniguchi is the number two ranked contender of the WBO. The number one spot is occupied by a Filipino, Robert Paradero.